The NewWave espresso cups are made in Germany by Villeroy & Boch – a German manufacturer of ceramics who created this one and only espresso cup set. In the recent years a lot of different coffee variations became very popular like cappuccino, Macchiato and espresso. The traditional way of coffee brewing is not in the focus anymore. Villeroy & Boch is a well know company which delivers flatware and kitchen accessories world wide. François Boch started 1748 a pottery company with his three sons in Lorraine, France. In 1801 the company moved to the German town of Mettlach and on 14 April 1836 merged with it’s competitor, Nicolas Villeroy – the story of perfect porcelain flatware began. The NewWave espresso cup serie of Villeroy & Boch is a new fine china line. They developed the best porcelain combined with the best functional characteristics. This porcelain line is appreciated by families as well as restaurants – the best for your daily use. The design is not necessary for the perfect espresso, but we all like to have something special and of high quality in our kitchen. The design of the NewWave espresso cups is different to all other espresso cups that are available. The handles are ergonomically formed and are pleasant to hold – which is not easy as espresso cups are very small. The demitasse cup comes along with a aesthetical saucer. The saucer has a nice deepening for the cup. The clue is that there is enough space on the saucer to put some Petit Fours or cake on – two in one. The nice swing of the handle and saucer will put a smile on you guests face and you surely get a ‘WOW’. Buy along some nice demitasse spoons. Espresso reflects the Italian way of life. Than why not drinking your espresso out of a cup with an Italian design. The writting on the cup is eg. Colloseo, Villa, Piazza – these words describe some very old buildings in Rome where Caesar once reigned. Drink your coffee the British way – out of a British designed NewWave espresso cup. Get some scones or ginger bread and read some royal news besides enjoying your coffee. The writting on the cup is eg. Portobello, Tube, St. Pauls – which are great places that you have to visit during your London visit. Dreaming about France and the Eiffeltour? Relax with a sensational cup of espresso coffee and enjoy a tasty croissant with this French cup design. The Villeroy & Boch espresso cup set includes a small demitasse with a capacity of 2.5 oz fl. – perfect for a double espresso. The set also includes a saucer of first choice of premium porcelain which measures 6.7 x 5.1 in (17 x 13cm). The small demitasse cups of Villeroy & Boch are very handsome and come in different colors – perfect for drinking your espresso and decorate your dining table. At home a coffee-to go cups is not the right to relax. To make the perfect espresso you not only need tasty beans, soft water – you need the perfect espresso cup. 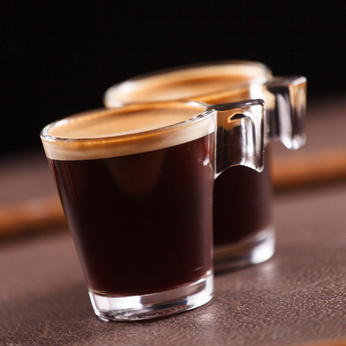 Espresso is brewed with 92 degrees and served as hot as possible. Therefore a small demitasse is needed to store the temperature. Use our one of a kind Full espresso cups comparison chart.